1,000 FREE SPINS ON STARBURST - WINNER TAKES ALL! It's time for the biggest race of the year! Never mind the Grand Prix and all of it's glamour - the real action is taking place at bgo this weekend! 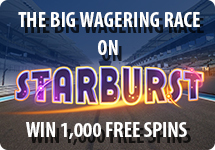 Simply wager on any bgo game between Friday 18th July and Sunday 20th July and you will be racing towards the finish line, where 1,000 FREE SPINS on Starburst await the winner! The player who wagers the most over the weekend will take their place on top of the podium and win the free spins. By spinning The Boss's Wheel, you could win up to 20 FREE SPINS on one of our most popular games - Jungle Trouble. Better yet, every funded player gets 1 free spins per day, so you really can play and win for free! You could also win extra spins by completing some of The Boss's challenges, so be sure to check those out! You can play your free spins by visiting The Boss's Wheel page. Good luck! All Funded players receive 1 free spins per day. Additional spins available by completing challenges. Free spins won can be used at any time on Jungle Trouble only. Approximately 1 in 3 spins of the wheel are successful. 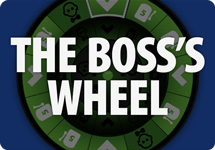 The Boss's Wheel is provided to players as a promotional game and may be removed at any time. All Boss's Wheel spins will be reset to 0 at the beginning of each calendar month. All winnings from Free Spins subject to standard wagering requirements. Enhanced wagering requirements apply for selected players.